When I used to live in Boston, I would frequently take the bus to New York and spend the day exploring the city. Now that I’m back on the west coast, I find myself missing the busy streets of New York and of course, the food. In my last visit to New York, I went to dine at the famous Katz Deli and was blown away by the pastrami Reuben sandwich. The quality of the pastrami was phenomenal, even the wildly popular Langers in Los Angeles does not compare. Alas, since I do not see myself going to New York any time soon, I have but no choice than to make pastrami myself, using a recipe that claims to yield pastrami very similar to Katz’s. 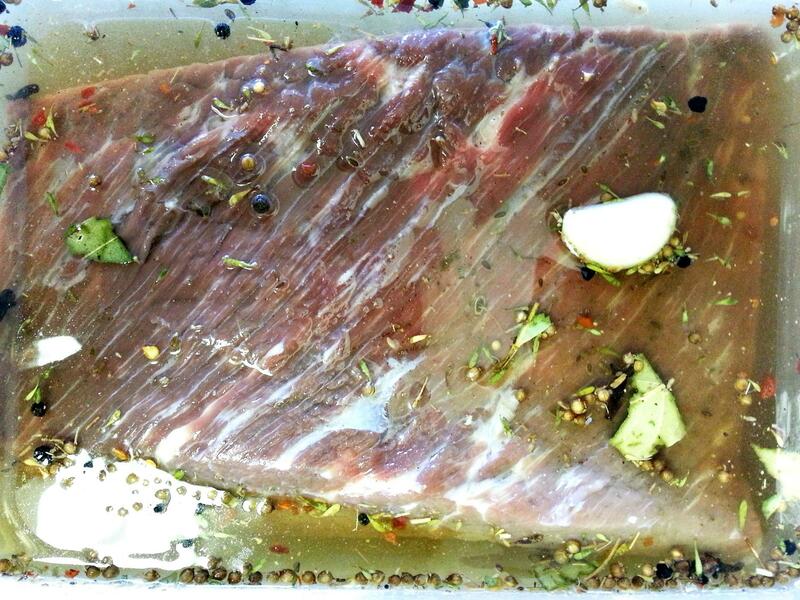 The process took about 2 whole weeks, first making corned beef than turning that into pastrami. I’m not going to lie, it was a lot of work just for a couple of sandwiches, but the quality? Amazing! Smash the cinnamon sticks and peppercorns with a meat tenderizer or hammer until crumbled. Tear up the bay leaves into flakes about 1/8 inches. Mix the cinnamon sticks, peppercorns, and bay leaves with the remaining ingredients and store in a tight jar. Make the corned beef. Trim the fat on the beef brisket to a 1/8 inch thick layer. Stir together water with dark brown sugar, salt, pink curing salt, pickling spices and garlic in a large container until the sugar has dissolved. Add the beef brisket, placing a weight on top to keep the brisket submerged. Chill in the refrigerator for 5 days, rotating the brisket every couple of days. Drain the corned beef brine. 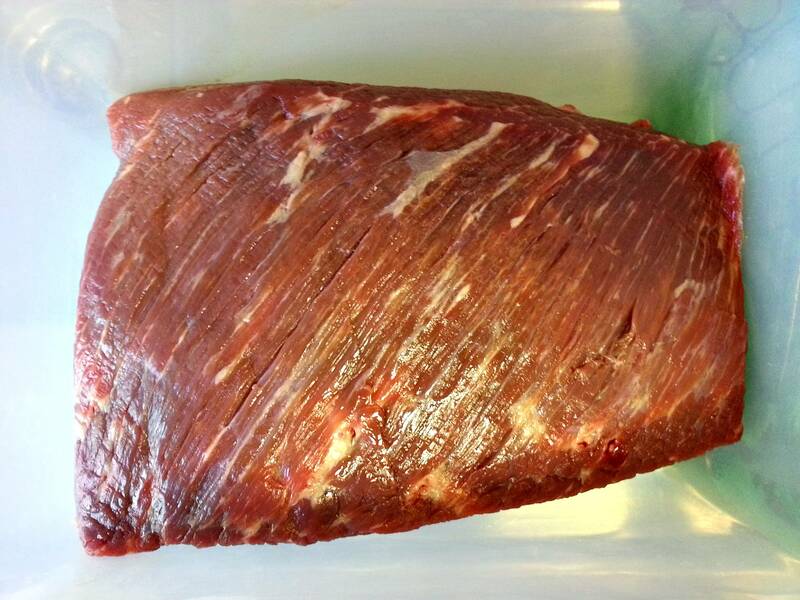 Place the corned brisket in a large container filled with clean water and let it sit for 8 hours in the refrigerator. Drain brisket and rinse. 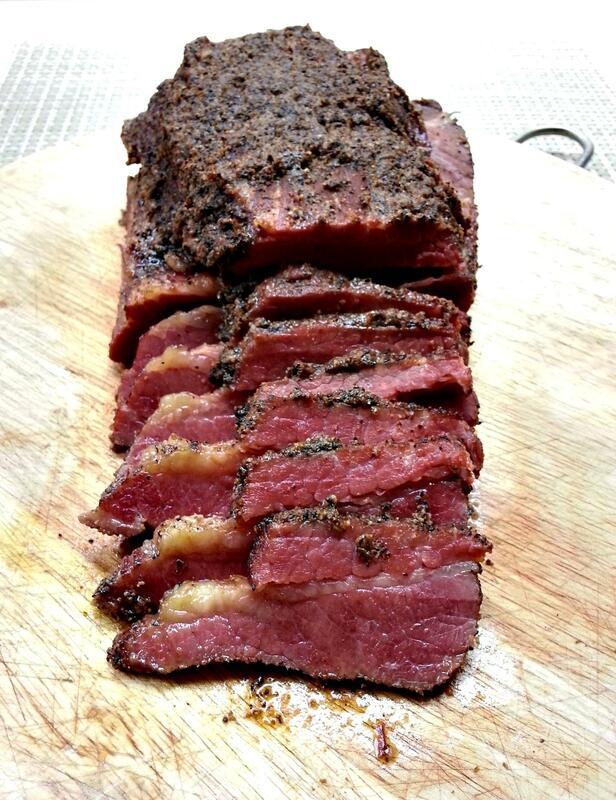 Combine seasonings for the pastrami (black pepper - onion powder) in a small bowl. Season the corned beef with the seasonings on both sides. Let marinate in the refrigerator uncovered for 2-5 days. Preheat oven to 200 degrees F, placing the oven rack in the lowest position. Line a large baking sheet with 2 sheets of aluminum foil, making sure you have enough foil on both ends to cover the brisket. Scatter wood chips in an even layer on the bottom and place a roasting rack on top. Place the brisket, fat side up on the rack. 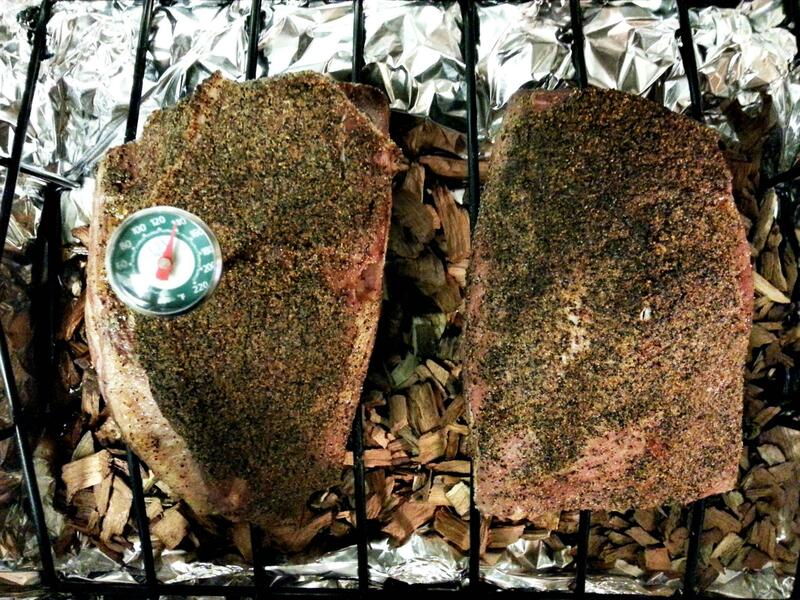 Gather the ends of the foil and cover the brisket, crimping the open ends together to create a sealed tent. Place a roasting rack over two medium over medium-high heat. Heat until a steady stream of smoke arises. Transfer to the oven and smoke 8-10 hours or until the internal temperature is 140 degrees F. Remove from the oven and cool. Cover and let cool overnight in the refrigerator. Heat a steamer. Place the brisket in the steamer and steam for 1-2 hours or until the internal temperature if 203 degrees F. Remove from heat and slice brisket 1/8 inch thick against the grain. 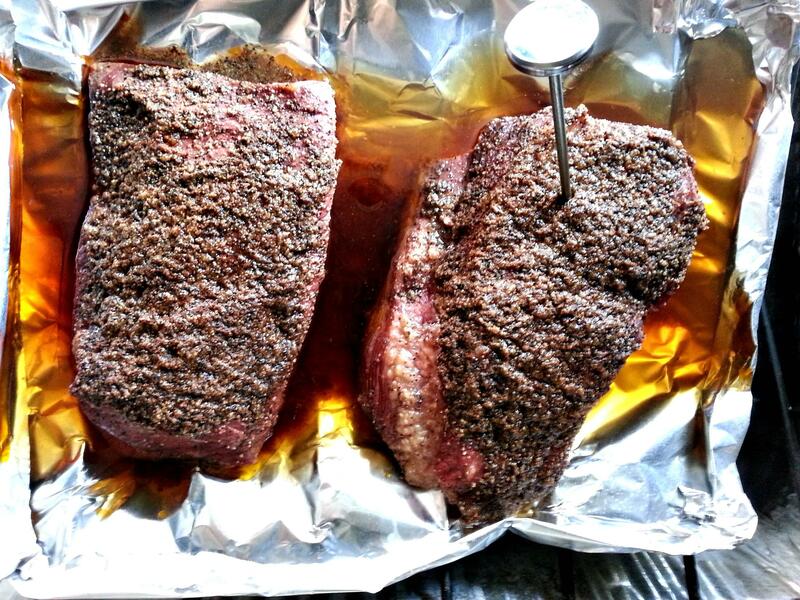 Place the sliced pastrami on a baking sheet. Top with sauerkraut and sliced swiss cheese. 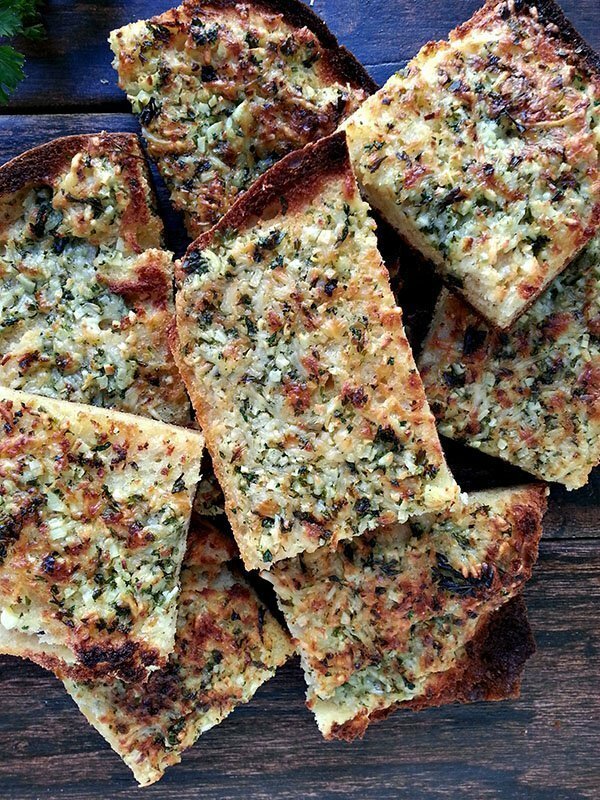 Place until the broiler until the cheese has melted. 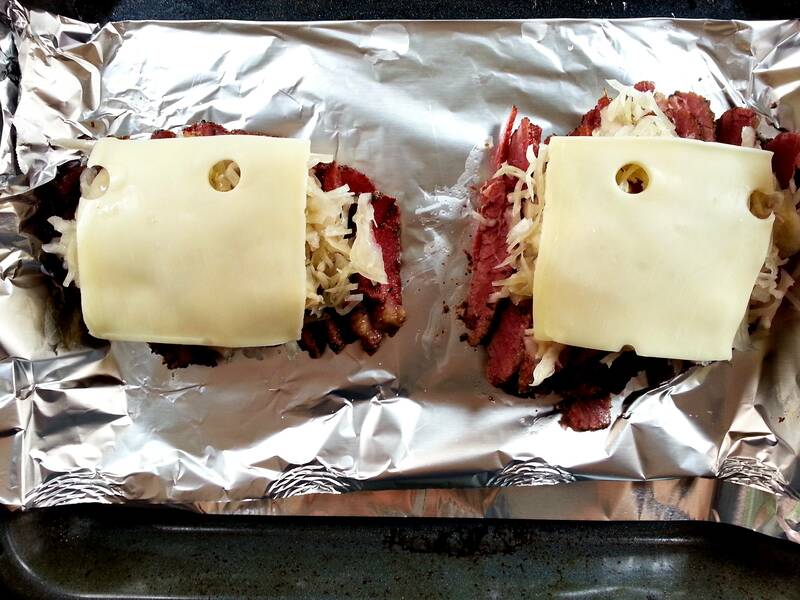 Remove from the broiler and place the pastrami on a slice of toasted rye. Spread thousand island dressing or spicy mustard on the other slice of bread and top the sandwiches. Serve. Brisket consists of two muscles, the point muscle, and the flat muscle. 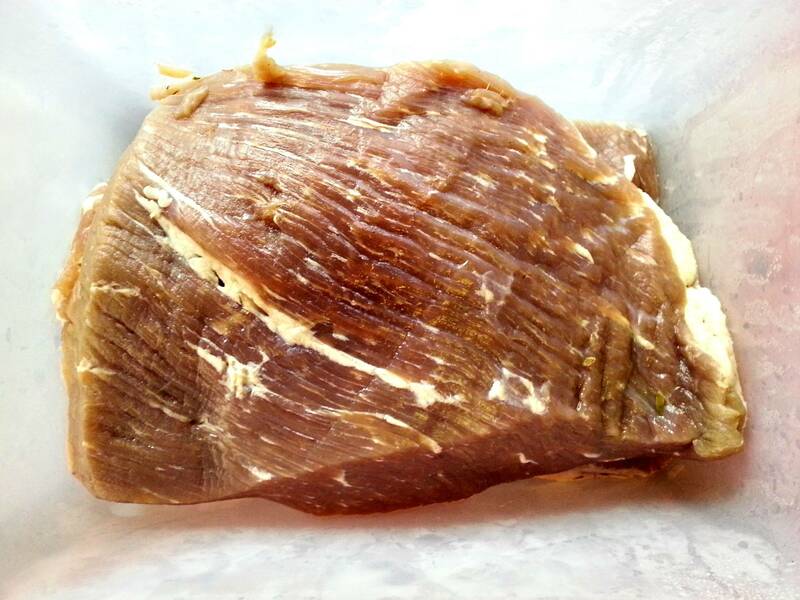 If you purchase your brisket at a butcher shop, you can choose to get packer meat, which includes both muscles, or have it separated into the two muscles. It is highly recommended that you cut the meat in half to allow for a quicker cooking process. Now if you were to make corned beef, you want to remove most of the fat, leaving only about 1/8 inch on top. However, if you are making pastrami, you want to leave the fat so that you will have a more tender and juicy sandwich. Unfortunately, all of the brisket at my local market did not have much or any fat. When preparing the brine for the brisket, you must use pink curing salt #1 NOT pink curing salt #2. Pink curing salt #1, also known as Prague powder, only has sodium nitrite, while pink curing salt #2 has sodium nitrite and sodium nitrate. This pink curing salt contributes to the pink color and kills the bacteria in the meat. I had to purchase mine online at Amazon.com; however, you can substitute it with 2 tsp of table salt. Just keep in mind that your meat will be brown in color. You must use a non-reactive container when brining the brisket. This excludes aluminum, copper, cast-iron, garbage bags, and styrofoam. These materials all react with the salt and give the meat an undesirable flavor. Five days later and the corned beef is ready. You will find that the brisket is slightly tan in color and looks as it did raw. Of course, you can skip all these steps and buy already prepared corned beef. After you have soaked the corned beef in water, season generously. 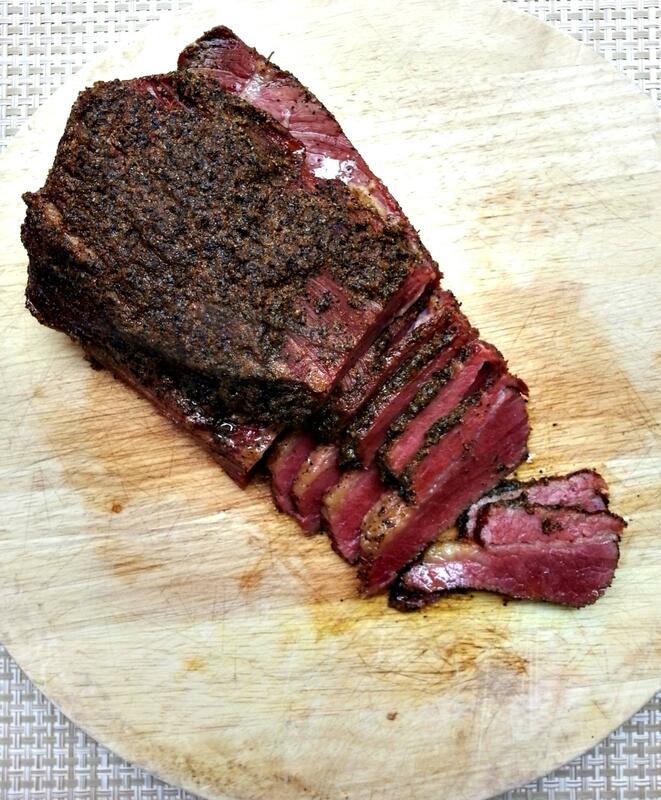 The longer the pastrami sits in the seasonings, the better it will taste. I let mine sit for 5 days. Now it is finally time to cook the pastrami! If you have a charcoal smoker, this is the best equipment to use. The charcoal produces a deeper darker crust than gas or electric smokers. For the wood, any type will do since the pastrami already has so much flavor. If you are like me and don’t own a smoker, you can use your oven! Preheat the oven to 200 degrees F with the oven rack in the lowest position. Line a large baking sheet with two long sheets of aluminum foil, overlapping 1 inch in the center. Make sure the bottom and sides are covered and that there is enough excess foil. Scatter wood chips in an even layer in the bottom of the pan. Place a roasting rack on top so that it is 1 1/2 inches above the chips. If your rack isn’t high enough, you can flip it over. Place the brisket with the fat side up on the rack. Pull up the sheets of foil to extend over the meat, crimping the open ends tightly together to create a tent. Bring up the foil on the sides and crimp the edges together so that there are no gaps or open ends. Place the roasting rack over two burners over medium-high heat. Smoke for about 5 minutes or until a steady stream of smoke starts to pour out. Transfer to the oven and smoke for 8-10 hours or until the internal temperature is 140 degrees F.
Remove the pastrami from the oven, cool to room temperature, chill and continue with the steps on how to steam. Since the pastrami is rather large pieces of meat, they did not fit in my steamer. No problem here because you can make one with your baking pan! Preheat the oven to 350 degrees F. Fill a baking pan with -3 inches of water and place a roasting rack or wire rack in the baking pan. Lay a large sheet of aluminum foil on the rack and place the meat on top. Fold up the edges of the foil to create a bed for the meat and sealing up the edges. Doing this allows the pastrami to steam in its own juices, making it even juicer! 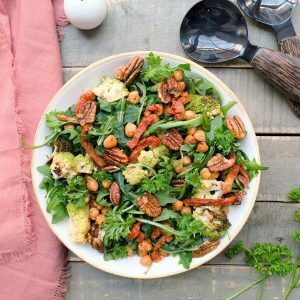 You may need to add more water during the cooking process depending. 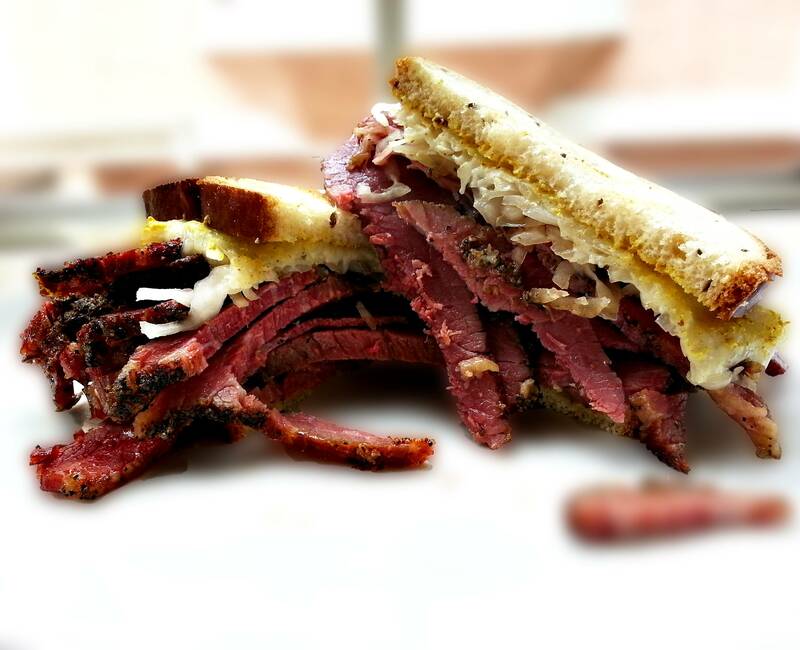 Now making a pastrami Reuben is entirely up to you. 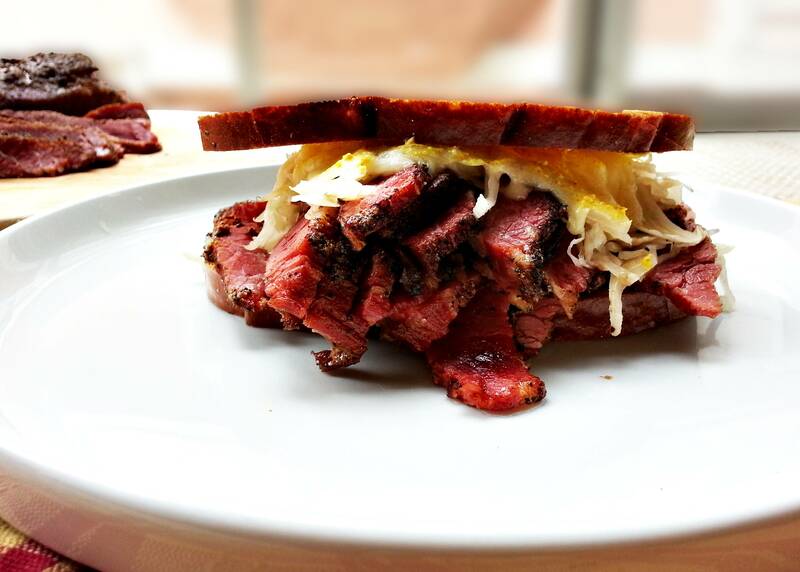 You can make a simple pastrami sandwich and it will still be outrageously delicious. When slicing, make sure to slice across the grain. In other words, you want to see which direction the lines in the pastrami go. Cut the opposite direction of those lines. If the lines are horizontal, slice vertically. Slicing across the grain gives you less chewy pieces. I cannot begin to describe how delicious this pastrami is! I was nervous about the outcome until I sliced into the pastrami and saw the juices pouring out. I can’t help but boast that I think this pastrami is comparable to Katz deli. The spices make the pastrami so incredibly flavorful and the slow smoking process combined with the two hours of steaming yielded a tender, fall apart pastrami. Thank goodness I made extra because I cannot get enough of this pastrami! Delicious, may well find the enthusiasm to do this one day, thanks. I was just wondering why the internal temp. needs to be 190-200 in a smoker and only 140 in your oven. Thanks. The heat sources are different in a smoker and an oven. The oven heat is stronger than the heat in a smoker, even at low temperatures, so the pastrami should be cooked only until 140 in an oven. Hope this helps clear things up! What happened to the recipe? I have come to this web page twice before and it contained a complete recipe for making first a corned beef, then a pastrami. Now, it appears something has gone missing - there are no instructions for corning or smoking??? What happened to the rest of it? I changed the format of the posts; to find the recipe click on the link above. It has instructions for how to make the corned beef and pastrami. Enjoyed your post, When you steam, at what internal temp do you take the brisket to? You want to take it to 203 degrees F.
Hi ! 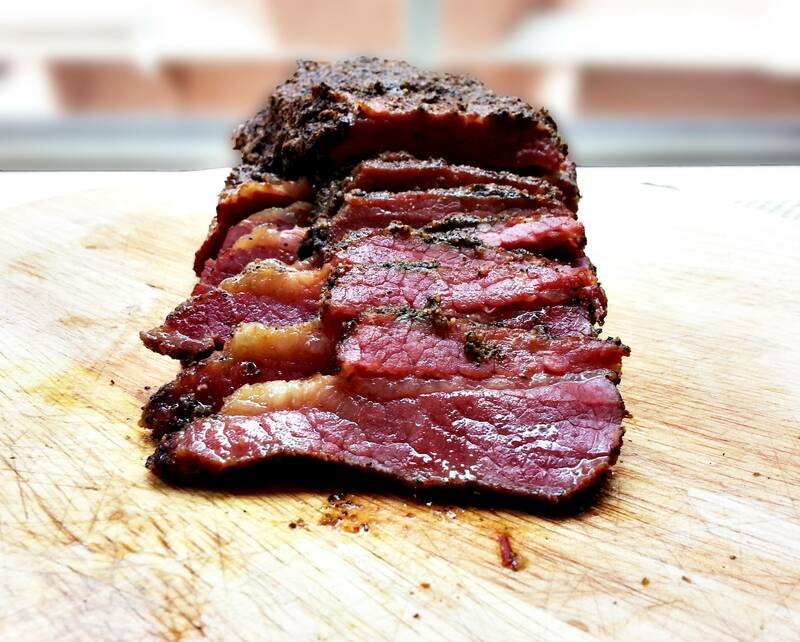 This is a great recipe of Pastrami that I want to try soon! i am just wondering... After you rub the meat with spices, where do you let it sit during 5 days? in the fridge ? covered in film or...? I'm confused or maybe I've missed reading something in your post. Thanks in advance for your answer! Let it sit wrapped in film in the fridge - think of it as marinating the meat! Hope that clears things up! To begin with...Your a genius! I do have one question about the steaming? Do I wrap up the meat? Do I add water and then seal up the meat? and what temp degree do I put it in the oven at or do I steam on the cook top? I confused about the steaming process? Hahah thanks! Nope no need to wrap up the meat when steaming. You can just place the entire chunk on the steaming rack, cover, and let it do its thing! Ok, I’m a box of rocks.... is the steaming process just to warm up the pastrami? 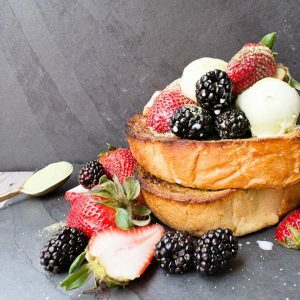 Is a steamer similar to a roaster? So if your answer is “yes”. Then I do this process just before I want to carve and serve the meat! “Box of Rocks”. Hahah I love that "Box of Rocks." Sorry, I should have been more clear in the directions. So the steaming process continues cooking the meat and makes it more tender. The way it works is you have a pot of simmering water. If you have a steamer basket (basically a basket or rack with holes in it) you place the rack on top of the pot, put the meat on the rack, cover and let it cook. The steam from the water is what cooks the meat - you don't actually want the meat to be touching the water basically that will boil it! This is what a steamer looks like just to give a mental picture: https://www.amazon.com/Stainless-Steamer-Steaming-Cookware-Concord/dp/B0086ANRGU/ref=sr_1_26?keywords=kitchen+steamer&qid=1554056393&s=gateway&sr=8-26. So the bottom pot is what holds the water and the top rack is where you would place the meat. If you don't have a steamer you can create one with what you got! You can use a large pot, fill it with about 2 inches of water and bring it to a simmer over the stove top. Place a metal trivet in the center of the pot and put an oven-safe bowl (I like to use pyrex bowls) on the trivet. You place the meat in the bowl, cover the pot and steam. The water may run out; just fill it with more hot water and it will be fine. It can take anywhere between 1-2 hours to get the meat temperature up to 203 degrees F. I would check with a meat thermometer after 1 hour and see if it needs to continue steaming. You can also use a baking pan and a roasting rack like I did in the pictures. You get a baking pan, fill it with about 2 inches of water. Place a roasting rack on top and a large piece of aluminum foil on the rack. Place the meat on the aluminum foil and fold up the edges of the foil to seal all the open edges. Place the entire thing in the oven in the oven at 350 degrees F and steam. Oven it's done steaming, you can slice it up and serve! Hope this helps clarify a bit. Let me know if you have any other questions! Ok, “box of rocks” here!!! One more question... I bought my brisket... it is a beautiful USDA Prime piece of meat and it weights 17.64 lbs. with a whole side of fat!!! (yes I went a little crazy-I had a rancher who raises Angus beef standing next to me telling me what a great piece of meat it was and it was only 3.48/lb). So I have this monster piece of meat. My question is... this weights 4 times what your 4lb brisket weighed. So I should multiply all the spices by 4 to get the proper proportions, right. It is actually 4.5 x to get the most correct proportion. Your so kind to answer all these questions. Hello Christine, “box of rocks” here with one more question.. I went yesterday and got my Brisket, it weighs 17.64 lbs. yes I went crazy and it didn’t help that a rancher who raises Angus was telling me what a good deal that a USDA Prime brisket was selling for $3.46/pound. So with that being said ... and this is my stupid question... I will need to quad my spices right. Since my behemoth brisket is like 4 times the size you recommended which was 4 lbs, right? It is actually 4.5 times bigger. And it will probably take longer to cook? But you gave me the internal temps and that is what I will go by for doneness. Your so patient answering my dumb questions. I’m starting my brisket as soon as I get your answer. I’ve gotten all my spices sitting in a giant heap ready to go. So wish me luck and good eatin!!! Thanks again you’ve been a doll! Wow that's a huge brisket! Okay, so the pickling spice actually makes extra so you can just do 2x the amount. For the corned beef section, I would do 3x the original amount - as long as you have enough water to cover the brisket submerged it should be good. For the spices for the pastrami, 4x the amount should be more than enough. You may end up using less. 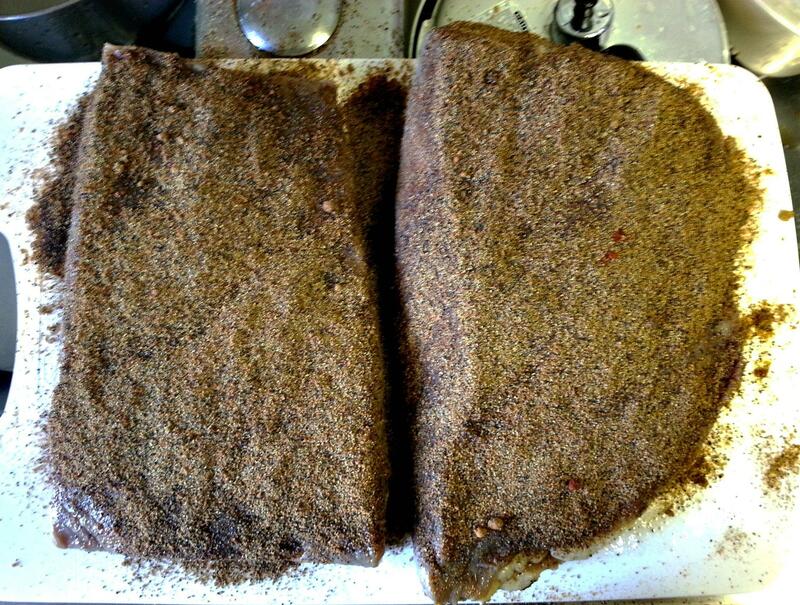 As long as all the sides of the brisket have a nice coating of the spices, it should be good. For the cooking time, yes it will take much, much longer. You can cut the brisket into 2 slabs to cut down the cooking time. It also depends on how thick your meat is. I would still check it after 8 hours just to see where the temperature is at. If it's much lower than 140 degrees then you know it'll still be a while before it's done. Good luck!!! 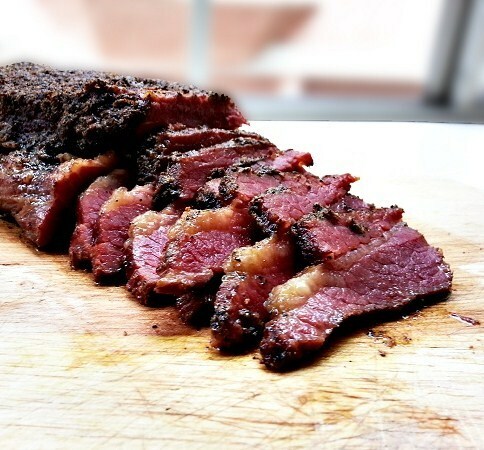 All this talk about pastrami is making me think I should make some too! Let me know if you have any other questions!